Good at over 275 locations for the purchase of food, fuel, snacks, beverages, and more! 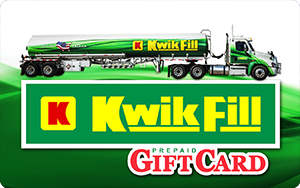 Works like cash and can be reloaded at any Kwik Fill location or by calling Customer Service at 800-443-3523 ext. 4762. Call Customer Service for large volume Gift Card purchases. Note: If your browser automatically filed the form with your email address and password, delete that information and type your gift card number and pin in its place.